The Dena'ina language is sometimes referred to as Dena'ina Athabascan, in order to emphasize its relationship to the interrelated family of languages indigenous to Interior Alaska, western Canada, the northern California and southern Oregon coast, and the desert Southwest United States. Unlike the name Dena'ina, which is clearly a Native word (from dena 'person + 'ina 'many'), the name Athabascan does not come from Dena'ina or any other Athabascan language. Although the spelling of the name has been a source of disagreement and debate for 175 years, there is no argument about its origin (see Krauss article). It derives from a place name in the Cree language of western Canada. 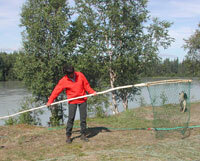 The name in Cree is something like ahdhap-ask-a-w, which translates roughly as 'where there are plants distributed in a net-like pattern', as in a shallow end of a lake. The name is fairly common in Cree, but the actual place it originally referred to is unknown. It is now the name of a large lake known in English as Lake Athabasca. How did this Cree place name come to be used to identify a language family? The precise answer is found in the writings of Albert Gallatin, a businessman and politician who had a particular interest in the classifications of Native American languages. In 1826 Gallatin concluded that all the "inland tribes" of the northwestern part of North America belonged to one family and spoke related languages. He acknowledged that the name for these related languages was entirely his own individual preference. "I have designated them by the arbitrary denomination of Athabascas, which derived from the original name of the lake," he wrote. Since then the name has been variously spelled Athapaskan, Athabaskan, Athapascan, and Athabascan. For many years ANLC's preference was Athabaskan (see Krauss article for explanation), and all ANLC publications and language courses adhered to that standard. On March 20, 1997, Tanana Chiefs Conference adopted Resolution 97-35 designating Athabascan as the correct spelling and requesting that other entities follow that policy. In respect for that resolution, ANLC has adopted Athabascan as its preferred spelling. Adapted from The Name Athabaskan by Michael Krauss (In Faces, Voices & Dreams: A celebration of the centennial of the Sheldon Jackson Museum, Sitka, Alaska, 1888-1988, ed. by Peter L. Corey, 105-08. Sitka, Alaska: Division of Alaska State Museums and the Friends of the Alaska State Museum, 1987).